Taken up before all on the face of the earth harmed. On the twenty-second the revered bones appeared in the earth. During the persecutions against Christians the relics of the holy martyrs were usually buried by believers in hidden places. 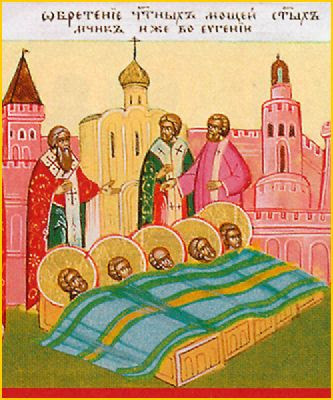 So at Constantinople, near the gates and tower in the Eugenios quarter,* the bodies of several martyrs were found. Their names remain unknown by the Church. When miracles of healing began to occur at this spot, the relics of the saints were discovered after an investigation and transferred to a church with great honor. The discovery took place in the days of Patriarch Thomas I (607-610). ** When the relics were displayed for veneration, many sick who attended were cured. 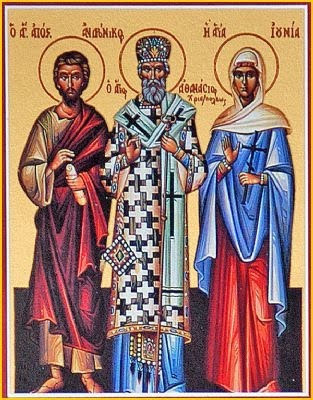 It was revealed many years later to a certain pious clergyman, Nicholas the Calligrapher, that among the relics discovered at Eugenios were the relics of the holy Apostle Andronikos of the Seventy and his assistant Junia (May 17 and July 30), whom the Apostle Paul mentions in the Epistle to the Romans: "Greet Andronikos and Junia, my relatives and my fellow prisoners; they are prominent among the apostles and they were in Christ before me" (Rom 16:7). In the twelfth century, a great domed church was built on the spot where the relics of the holy Martyrs were discovered. This work was undertaken by Emperor Andronikos I Komnenos (1183-1185), whose patron saint was the holy Apostle Andronikos. * The Gate of Eugenios, between the Prosphorianos Harbor and the ancient Acropolis district of Constantinople, north of Hagia Sophia, was near the Seraglio Point, which is the apex of the triangle formed by the city on the Bosporus. ** The Great Synaxaristes records that the discovery took place during the reign of Emperor Arkadios (395-408). 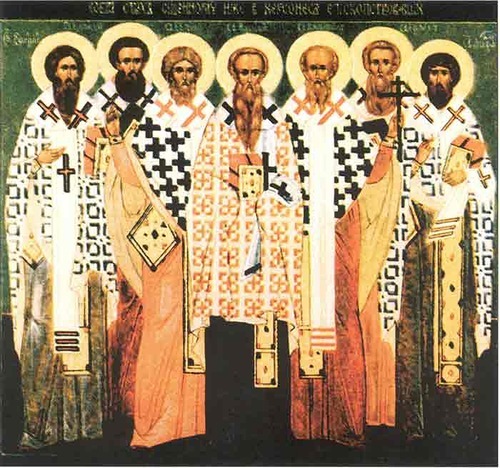 However, a conflict exists since Patriarch Thomas I came to the throne of Constantinople in the seventh century. There are three possible reasons for this inconsistency: 1) a transcription error; 2) they did not want to ascribe the discovery to the tyrannical Emperor Phokas (602-610); or, 3) it is possible the relics were discovered on two different occasions, first during the reign of Arkadios then during the reign of Phokas. This latter theory is most probable, since the Synaxaristes indicates that the relics of the Apostle Andronikos and Junia may have been discovered when it was revealed to Nicholas after "many years". O glorious Martyrs, you foundations of the Church, your venerable relics have appeared from the depths of the earth like spiritual roses and treasuries of graces. They breathe forth the grace of healing and grant the fragrance of life to those who lovingly call you blessed. When ye shone forth from the earth like luminaries, ye dispersed the gloomy mist of all impiety, O Saints, and ye enlightened believing souls, O godly Martyrs who championed the Trinity.